Take a look at the main types of digital camera optical Image Stabilization modes. Learn which mode to use for a particular scene, or when not to use Image Stabilization at all. Optical Image Stabilization helps produce clear, blur-free images by reducing the effects of camera shake when hand-holding a digital camera. Image stabilization has improved during the years and most types of IS quite effective. Today, the feature is standard on many compact digital cameras, though not all cameras have each type of image stablization listed below. Optical Image Stabiliztion is more effective than Digital IS. When a digital camera is set to Continuous Image Stabilization mode, IS is always on. It keeps an image stable when viewing it on an electronic viewfinder or LCD. It’s ability to reduce camera shake can be slightly less effective than using Shoot Only mode. But since Continuous IS stabilizes viewing, composing is often easier. Continuous IS is effective for shooting video and is usually enabled by default when switching to movie mode. Continuous IS is also helpful when hand-holding a camera to frame a long telephoto shot. It is especially effective when using taking telephoto shots with a digital zoom where the slightest camera movement is magnified when viewing a scene. Continuous IS works best in good light. Both photos were taken hand-held at 1/25th second. 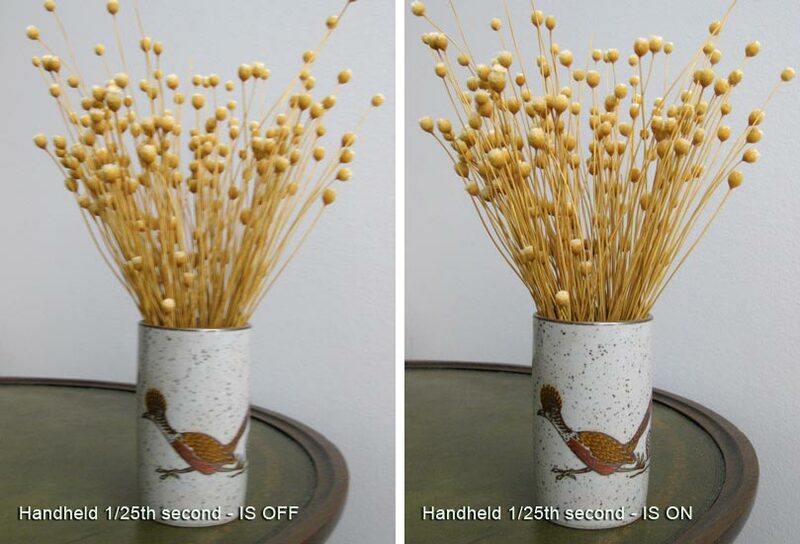 Shoot-only Image Stabilization turned on for photo on the right. Click for larger view. Digital cameras with Image Stabilization are usually set by the manufacturer to Continuous IS mode, but many photographers change the setting to Shoot Only IS mode. Shoot Only IS mode offers the greatest degree of stabilization. It is activated the moment the shutter button is pressed. Because Image Stabilization is enabled only when the shutter button is pressed, Shoot Only mode generally produces slightly sharper photos than Continuous IS. Moving a camera in the same direction as a moving subject is called panning. The technique produces images with the subject in sharp focus and the background blurred. Panning IS mode only makes adjustments for vertical movement and is activated, automatically on some models, when the camera shakes up and down. Hybrid Image Stabilization –helps prevent image blur during macro photography, counteracting angular and shift shake that becomes more pronounced when taking close-ups. Digital image stabilization – to minimize the effects of camera shake, digital IS increases the shutter speed by boosting the ISO sensitivity. However, when ISO is increased, so does noise in images. Optical Image Stablization is preferable to digital IS. Dual image stabilization – Dual image stabilization combines optical IS and an increase in ISO. Digital Single Lens Reflex camera Image Stabilization is either in the camera body itself, or in individual lenses. Tip: Some manufactures recommend that Image Stabilization be turned off when using a tripod or other camera support.